Maps tell stories about the world around us. With a single map, an organization can locate underground pipelines, decide on the best place to build their next store, or inform customers about cell phone coverage areas. Today we're announcing the Google Maps Engine API, allowing developers to bring the power of Maps Engine into their own applications. 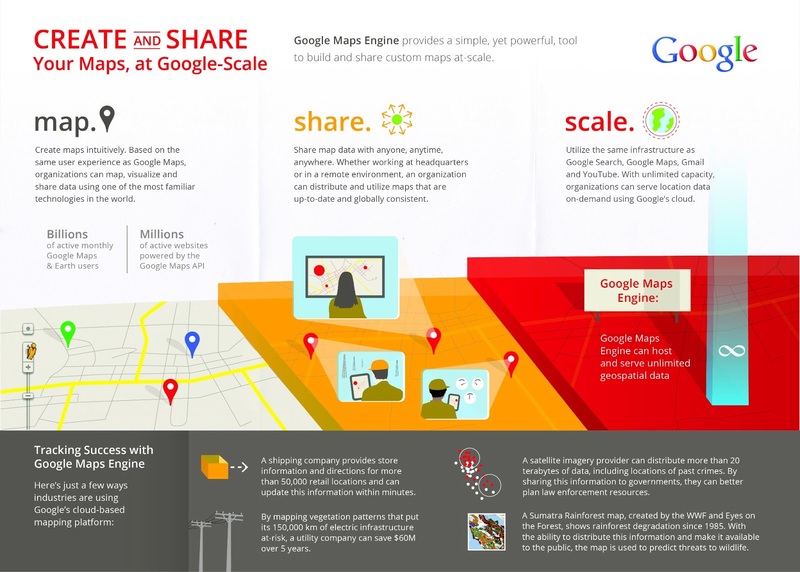 Maps Engine lets organizations use Google’s fast and reliable cloud infrastructure to layer their data on top of a Google Map and share their custom-made Google Maps with employees, customers or the public-at-large. At the push of a button an organization can share their maps internally or publish them on the web, making it easy to access their data from anywhere. The API provides direct access to Maps Engine for reading and editing spatial data hosted in the cloud. With the API, organizations can develop on any platform - web, Android, iOS and server-to-server - and build applications like store locators, crowdsourced maps or crisis-response maps. For example, FedEx.com uses the API to query its more than 50,000 retail locations and IRIS creates applications for utilities to track underground pipelines. Google Maps Engine is changing the way enterprises create and use maps - replacing complex GIS technologies with accurate and comprehensive Google Maps-based tools. Contact sales if you are interested in Google Maps Engine or learn more about today’s newly launched API.